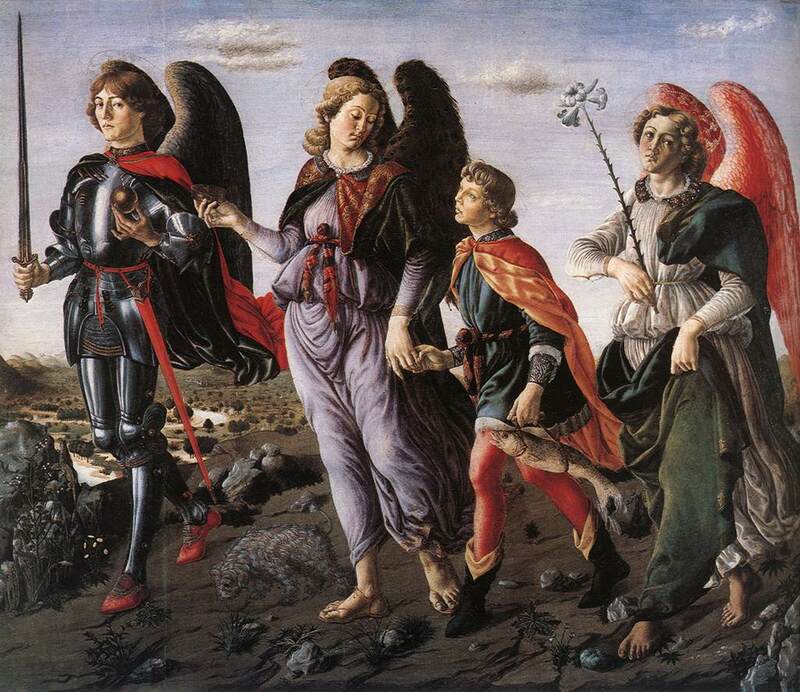 The Archangels – Michael, Gabriel, and Raphael – are familiar figures for most of us. But there are some places that they turn up in the Bible that might surprise you. We invoke St. Michael for protection against Satan for ourselves or others especially at the hour of death. Rightfully so. He’s a powerful warrior against evil. But, did you know that St. Michael also appears twice in the Book of Daniel? since the nation began until that time. others to reproach and everlasting disgrace. In Hebrew, Gabriel means God is my strength, and it’s fitting that, with that name, he was chosen as the one to appear to the Blessed Virgin Mary. His greeting, “Hail Mary, full of grace” has echoed throughout the generations of Christians. By agreeing to St. Gabriel’s request to become the Mother of God, Mary certainly needed every bit of strength God could give her. But, there are others to whom Gabriel acted as messenger. Again, we find him – twice – in the Book of Daniel. As he spoke to me, I fell forward unconscious; he touched me and made me stand up. I was still praying, when the man, Gabriel, whom I had seen in vision before, came to me in flight at the time of the evening offering. He instructed me in these words: “Daniel, I have now come to give you understanding. When you began your petition, an answer was given which I have come to announce, because you are beloved. Therefore, mark the answer and understand the vision. and a holy of holies will be anointed. there shall be seven weeks. Raphael, in Hebrew, means one who has healed. You may recall that St. Raphael came to the rescue when Tobiah’s worried parents, Tobit and Anna, sent him off on an arduous journey to Media to seek his destiny. The trouble was, Tobiah didn’t know the way. St. Raphael did, though, and he appeared to Tobiah in the guise of a relative named Azariah and offered to be his guide. He accompanied Tobiah through nine chapters, leading him to Echbatana where he met Sarah and married her, and on to Rages, and all the way home again. St. Raphael taught Tobiah how to use fish gall, liver, and heart for medicine as well as the expulsion of demons. Using the fish gall as he’d learned from Raphael, Tobiah cured Tobit’s blindness. Now when you, Tobit, and Sarah prayed, it was I who presented the record of your prayer before the Glory of the Lord; and likewise whenever you used to bury the dead. I was sent to put you to the test. At the same time, however, God sent me to heal you and your daughter-in-law Sarah. There are many other places in Scripture that tell about Sts. Michael, Gabriel, and Raphael and searching a Bible index will lead you to them. There’s so much more to the role they’ve had, and continue to have, in salvation history. Much of it, I’m sure, will surprise you. Angels, Catholic Church, Feast Days, Liturgical Year. Bookmark.